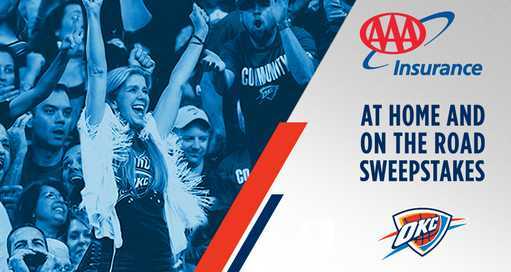 NBA Oklahoma City Thunder brings you the AAA At Home And On The Road Sweepstakes where they will be giving you the chance to win two courtside tickets to the Thunder vs. New Orleans Pelicans home game, Thunder Merchandise and much more. How To Enter: Go to this link:okcthunder.com/aaasweepstakes during the sweepstakes period and follow the online instructions to register by entering all information requested on the registration form and once you filled out the entry form now Click on the submit button to complete the registration form. Prizes: One lucky grand prize winner will win prize package which includes two courtside tickets to the Thunder vs. New Orleans Pelicans home game, Thunder Merchandise, Hotel accommodations, $350 Travel expense gift cards and much more. Who Can Enter: This Sweepstakes is open only to legal residents of Oklahoma State and who have reached the age of 18 years old at the time of entry. When To Enter: This sweepstakes entry begins at 12:01am CST on December 01, 2018, and all entries must be received by 11:59pm CST on January 01, 2019. Who’s Sponsor: The Sponsor of this Sweepstakes is AAA Club Alliance Inc., the Oklahoma City Thunder, the National Basketball Association and its Member Teams, NBA Properties, Inc.